My name is Aman Kumar(India) and my wife Kourtney Santiago(USA). I met her on Facebook 4years ago. We’ve had so many ups and downs in our life but we always stand for each other. 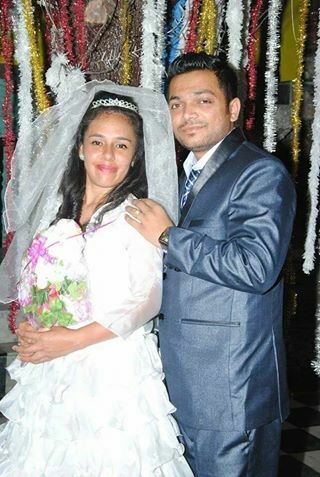 It was hard for me to get a visa to USA and meet with her so finally she came to India and we got married 2nd June 2014. I’m so lucky she dropped her everything and came to me for marriage. We are so happy. She is a wise and respectful lady. Thank God! Marriage is really beautiful! God created everyone’s missing rib, when you are destined by God from birth to be a part of another distance, circumstance(s) don’t matter. God is a divine way/match maker, he said in the bible that a thousand years for you is like a day for me.Your wife is that your missing rib, God brought her to fit that vacant space that was opened. She’s God sent, cherry, love respect and most importantly love her like yourself; cause she a flesh of your flesh and bone of your bone. God asked! Can any man hate himself? Folks! what is the answer? I am waiting. God bless what he has joined together.